After you read my last post, you probably assumed that my experiments with paper and plaster were done – ha! The next time I say something silly, like “I can’t see why ___ won’t work,” you have my permission to giggle. I mentioned in that post that I intended to use the plaster/recycled paper recipe for a thin shell on the face of the decorative masks, and then I would make the pieces stronger by backing the shells with paper strips and paste. I really did think it would work, but it doesn’t. As you probably guessed already (but were too polite to mention) when the paper mache dries it also shrinks, which causes it to pull away from the shell. “Delaminating” is the official term for it, I believe. You can see photos of the “instant” paper mache being mixed and how the first layer was applied in this previous post. After the cheesecloth is laid over the first layer I used a scrap of burlap to press the cheesecloth into the paper mache, which also gave it a fairly smooth surface. I then rinsed out my bowl, mixed up another batch with more paper, and added it to the back of the piece. This was also smoothed over with the burlap scrap. The finished piece feels remarkably strong, and it has an interesting “ping” when it’s tapped – similar to ceramics. 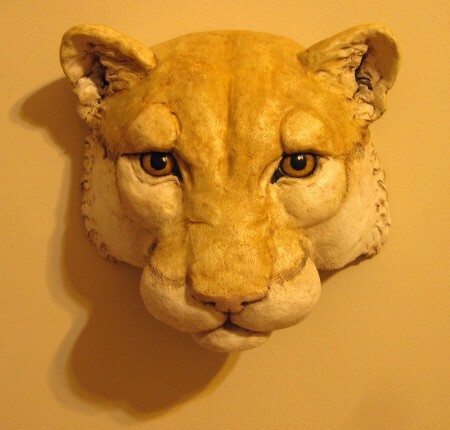 The cougar head, which is about 10″ wide, weighs 22 ounces. The idea of using two layers of wet plaster with cheesecloth in between was inspired by a project I found in The Barefoot Architect, a book about inexpensive third-world building methods. (They used cement and onion bags in place of the plaster and cheesecloth). The idea of playing around with plaster and paper pulp came from Jonty, as I mentioned in the previous post. The recipe makes a product similar to commercial Claycrete and Celluclay, but I use less paper so the plaster is able to completely fill the mold. This gives a very finely detailed surface, without the bumps and roughness that’s typical of the commercial products that I’ve tried. I don’t recommend this formula for one-of-a-kind pieces, because it sets up too quickly. 5 to 8 minutes is all the working time you get, which is fine for a mold, but way too fast for direct modeling. For working over an armature, the original paper mache clay recipe is still best. The plaster is mixed with the water and oil, and then the paper pulp is squished in by hand. This is brushed into the mold so that no air spaces get trapped. Same as the first, but with 1/2 cup paper and no oil. There’s nothing magic about the amounts, so there’s plenty of room for experimentation. This particular formula works for the series of decorative masks I’m making, but you should do some tests before applying the formula to a project of your own. I showed the process of making the silicone rubber molds in a previous post. Since then, I made a new cougar. I like the new one much better. The wolf and hippo also need some work, which means new molds for them, too – and that means that this series is getting a bit expensive. The final pieces cost just a few pennies each, but the molds cost around $15, and twice that when you do them over. Ah well – all part of the learning curve. I would be inclined to substitute construction plaster for craft plaster, as an experiment, because it has retarders added and it is easy to work with. When I have done plastering; I use Silver Set 40 (40 minutes working time). This might fix the short pot life that you have been experiencing. Thanks, Chris. I’ll give it a try. Thanks, Ann – that’s an interesting site. I’ll check out their products. Thanks Jonni, I did research it as well and nothing from the US anywhere. Talas museum conservation supplier that I ordered it from is no longer carrying it and there is not one single US source or distributor from my digging. So I guess that means we just work on perfecting our homemade versions! I’m trying to put together a simulation for the Paperclay brand ingredient list. It includes volcanic ash, wood pulp, starch, talc and preservatives. So far I did find that bentonite clay which I picked up from the healthfood store bulk section is the same thing as volcanic ash. It can also be easily ordered online from herbal suppliers and for about $6 a pound. So Im going to try putting that with paper pulp, talc, and starch? I’m not sure which kind ( something bugs won’t get to ?) and I don’t know if a Preservative is needed or not if it is used up right away. If anyone wants to join me in this experiment it might be worth a try for a lighterweight version for those maskmakers and others trying to avoid heavy plasters. Thank you so much for all ideas shared! I have been using a technique learned from a maskmaker where I paint a mold with polyfilla/weldbond glue backed with more of the same with cheesecloth pressed in, followed by paper strip layers, and (my insertion here) still experimenting with plaster and cheesecloth layers after. I am not making masks, but large wall hung sculptures. The polyfilla is the best thing in the world for capturing every detail from the mold and now I cannot get it because supplier is gone- help! So I tried researching how to make homemade polyfilla -which is cellulose reinforced plaster powder used for patching cracks and holes. It has a long setting time, and a smooth texture. Does anyone know what kind of cellulose that is? This is defintitely not the same as taking regular plaster and mixing it with paper pulp. The surface smoothness and detail is unmatched. I’m soo upset I cannot buy this anymore and want to make a homemade version. I’d never heard of Polyfilla before, but you sure to make it sound interesting. I found it on Amazon’s UK site, here, but when I tried to find out what the shipping costs would be the site said it couldn’t be shipped to my address. However, there were a number of other suppliers that show up when I did a google search using the keywords “pollyfilla buy”. Jonni I love this cougar! It is amazing. I don’t mean to be rude, but would it be easier to just make the hanging wolf mask and cut out the eyes? I new at this and need all the help I can get! I’m not quite sure what you mean, so I’m not sure I can answer your question very well. I don’t have a tutorial on the site specifically for wolf masks, but the techniques that work for one type of animal (or person) mask would work for all of them. Thanks so much! I understand that… but after seeing and reading the how to I think it can do it. P.S. That baby elephant is so cool! I think it would be fun to make a life sized horse for the colt…. have you tried it? I want to make a realistic wolf mask I can wear. How do you suggest I go about this? Hi Rocky – you can use the techniques I used for my Joker mask, but change the shape, of course. I used paper mache clay, but you could use paper strips and paste instead. For a name on these I think something with the work Safari in it would be good. Like Safari Treasures, or Safari Memories, or something on this order that would give the idea of wild animals that are hunted. You have done a fantastic job on these. Thanks, Joyce. Can we see the pieces you have in the show? I did a Google search for Redding Art Center, but I couldn’t find their website. I would really love to see the pieces you’ve been working on. Hi Cassie. I don’t think the paper mache clay can be used like modeling clay, because it’s always too thin. You can add some pottery clay to it, but if you do that you would actually be better off buying some cheap water-based clay and adding paper pulp to it. The kids love playing with real clay, and the paper in it prevents the clay from cracking when it dries. You can see my blurb about paper clay (the kind with real clay in it) here. The best part about paper clay, besides how much fun it is to play with, is that it should contain no chemicals or other toxic stuff that might harm your kids. Pottery supply stores have special “play clay” that’s cheap and easy to work with – if you don’t have a local supply store you can order some from Georgies – 25 pounds of play clay costs just $10, plus shipping, and that’s enough for many, many projects. I’m really impressed with how this turned out! Wow. Its awesome, thanks mom for yur technique to make the paper mache. So I’m very like with ur creatived. Thanks for all. I also found a sculpture.net discussion about plaster additives that add strength — everything from the bone meal liquid, to white glue, to egg whites. I remember the first time I tried your recipe I used the dried joint compound (didn’t have your instructions with me at HD when I was buying supplies) … I didn’t squeeze out much water from the shredded paper, so the the mixture was pretty wet. I ended up adding calcium carbonate, talc, plus some volcanic ash to get the consistency right, and the resulting casts were very lightweight and break/scratch resistant. Have you tried using powdered JC instead of plaster? Also adding white glue and/or starch to the mix? Hi Beth. Those are interesting links you gave us – I’ll have to check them out. I haven’t tried using powdered JC or any of the other items you mentioned with the original paper mache clay recipe, just because the recipe as-is has the same properties you mentioned, without the additions. When it dries it feels more like plastic than paper, although it still has a nice surface for painting. When I finished the very first thing I made with it, a little ball of paper covered with a thin layer of clay, I bounced it off the concrete sidewalk behind my house with no damage to the ball. (Not that I encourage anyone doing that with their sculptures, of course). Even so, I’m sure improvements could be made. The volcanic ash should do some interesting things, a bit like the Roman cement. With this latest experimental project, I did whip up a lot of different formulas. Some included white glue, and in some I added corn starch, or white flour, or water-based clay, and even Portland cement. In the end, the simplest formula worked best for my project. For now, I think I need to get on with making more sculptures and leave the rest of the experiments to others – but if you or anyone else comes up with different or better formulas, we’d all love to hear about them. There are so many simple quick fix soloutions i know would work for me here & that are within my price tag & easy to go out & purchase. You have to remember though ‘my’ experiments & what i show on my blog are more orientated for the artists out there who may be working to a tight money budget, or who may be trying to work with as many ‘around the home’ recyclable materials as possible. After all we do all as an avergae householders produce a mass of easily reuseable materials that can create art. Of course if your going to make art & sell it then the buyers want something they know will be worth what they paid & last years. Hence the experiments to find ways of achieving stronger art for as little cost as possible keeping it in easy grasp for as many struggling (financially) artists out there, maybe even in third world countries who could gain from it? If you are interested in a stronger plaster you might try Hydrocal. It’s described as 40% harder than Plaster of Paris. Even a mix of half Hydocal and half Plaster of Paris would give you all the strength you need in just one layer. Adding a little vinegar lengthens working time (not sure if that would help with just Plaster of Paris alone but you might find it worth an experiment). Hydrocal is available from many online art supply stores. Much cheaper if purchased from cement supply dealers. Your cougar mask is outstanding! Thanks, Steve. I’ve used Hydrocal, and it really is harder than normal plaster. Unfortunately, I can’t buy it here in town, and the shipping is expensive. However, it’s good stuff. The vinegar idea is interesting – I never would have thought of that. If I do a large piece that needs a longer working time, I’ll give it a try. I just took a look at this site with your suggestion but see the $ isn’t in my money and I don’t know how to figure the difference. Can you help and also wondering how long it takes to have it shipped? I think I might be able to help with this. You can find the type of plaster Jonty uses at pottery supply stores, and they probably carry it in a large art store, too. I bought some casting plaster a few years ago from Georgies, which is up here in Portland. Since the shipping costs more than the product itself, it would be better to find a local supplier. I’m sure you’ll find one nearby. By the way, why aren’t you using your new website URL when you comment? Links are good. 🙂 I love your new Jester. Adding a ‘little pure’ washing up liquid to cement makes it spreading & handling times a little better. Of course i am aware of this from my time (& youth) working in & around the building trades. Also since i am reffering to cement mixer machines load of the stuff at a time i simply could not begin to give any clues as to how much you’d need for small mixes we are talking about here. Perhaps starting at around say five eye droppers worth per every 400gms of wet plaster/cement made then reduce/increase experimentally? As i say i mixed cement by the ‘whole’ bag full in my time so can’t be more specific than that – Sorry. Are the cougar’s eyes glass or did you sculpt them and paint them with a clear coat? The whole piece is amazing! Hi Ann. 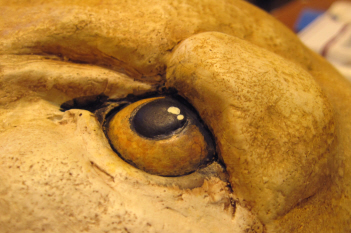 The cougar’s eye hasn’t been varnished yet – the photo in the post isn’t entirely realistic. I used a beeswax varnish for the rest of the head, but I’ll use an acrylic varnish for the eye. Thank you so much for the close-up. I have a terrible time with round eyes, too, perhaps that was why I was so astounded with your results. It is harder is ceramics because of the drying issue, so your method wouldn’t work, but given the expense of ceramics, I am seriously thinking yours is the better way for me to be creative. I can spend upwards of $40.00 to complete one small piece after firing and glazes! I can’t have a kiln where I live, so I am forced to pay to fire things. I was recently accepted at an art studio to show and sell my work, so creativity is foremost in my mind at the moment. Your talent is my inspiration! I would love to be at your level someday! Thanks so much for being so generous with your time and teachings. Yes, Ann – you could save a lot of money using paper, glue, plaster, etc. But ceramics will last for thousands of years, even buried under yards of dirt, while there’s no way to know how long my efforts will last. Congratulations for getting into that studio show. Having a venue like that can really crank up the creativity. I hope you do well with it. Be sure to let us see some of the pieces that you put into the show, and send us the date and times so I can post a link to the show’s website. Hi Ann. I hope you get better soon. Perhaps you can use some of your downtime doing some sketches of projects you’d like to do in the future when you’re feeling better. A few moments of creativity has to be good for one’s health. I have some eye experiments on hold & really need to get back to those soon. I was thinking of laying out the white & black sections, but then ding the coloured layers seperately by painting in a small section of the iris lines. Then coating in a thin layer of clear spray seal, then another set of lines, gloss seal, lines, gloss seal etc. So on & so on until the eye is built up. The coloured lines (thined out paints) seperated by the spray gloss seal should give the impression of depth in very few thin clear layers of the high gloss spray sealer. As i say on hold for now though. Jonty, I would definitely like to see the results of this experiment, when you have time to do it. It certainly sounds promising. Well it’s been a theory of mine for some time now to be able to build up ‘apparant’ illusion of layers & depth in a hand painted eye(s) only using as few as i don’t know (not for sure yet) say around six layers of details in the coloured pupils. I have a feeling by using seperating layer(s) of clear spray the perception of depth just may be achievable with as little effort & painting as possible. I have a simple method well two of them for making perfect ‘half’ eye rounds. One using pulp, plaster or strips. This produces an eye that needs painted white of course to produce that perfect shiny eye white eye look. The other method produces a perfectly smooth shiny highly polished white half eye ball that simply needs the retina & pupil added but also gives you a superb to look & feel of a glass or plastic half eye ball too. I will reveal more on that later lol. Lol it’s art supply run time of the month (next week) so i will definately try to remember to buy some fine art brushes for the eye project/experiement. Who knows i might even splash out on some acrylic paints, though the prices & the sizes of the containers may be out of my price range – Depends on what i need to top up on at the time lol. I normally prefer tempora paints. Today (yesterday Monday) my Ouroboros went under the first few layers of liquid latex molding soloution. Still a couple of layers to add then that will be ready to recieve some plaster pulp mix anytime from Wedensday onwards. I have six fist sized skulls to finish adding the latex molding soloution to (for future plaster pulp skull projects) as well. Some life size skulls (three) to de-mold then re-do more of. Then ALL next week it’s going to be all hands to the oars casting de-moulding lol. So definately at least the week after next before i carry out my old eye experiment activities lol. I definately will keep you informed too of course. I don’t have any actual plaster pulp creations ready ‘yet’, but i do have all the molds ready to work with/from. I am hoping to get to those projects next week if i can. I will send you some images of the projects of course lol. One of the mold based projects is a skeleton hand trophy/candle sconce idea i am toying with. Others include grouped skulls (project info when finished on that one) again others include skull faces for decorating around bowls etc, again more on those later too. I am trying to get the right mix for the plaster pulp first. Hmm i guess you can teach an old dog new tricks as they say. I might just have to give linseed oil a try. Perhaphs if i add it to my dry pulp prior to mixing in with the plaster it may give the pulp the edge & bond better with the sculpting plaster? This being my only issue with the mix so far. As i say i have never had any shrinking issues (that i have noticed any way) at the moment its obtaining a more solid ‘bonded’ core of the mix when dry. Much to think about (as usual lol) & much to do (again as usual lol) so better get off & get things done eh lol. I will keep you updated soon as i get there lol. Wow – thanks for showing us the projects. The realism is quite impressive. I’m not sure that adding oil to dry pulp will work, but it would be worth a try. I’m soaking my paper pulp ahead of time, squishing out most of the water and then adding it by hand after the plaster, water and a small dab of oil are mixed together. I probably makes a much wetter mix than you’re using, and I know that the more water you use, the less strong the plaster will be. So far it seems to be plenty strong for something that sits quietly on the wall, but for your pieces, which would be handled, it may not be strong enough. One could add more plaster, of course. To be honest, I’m not really sure the oil is needed at all, but you are much more methodical in your experiments, so you’ll have a much better idea about that than I do. I did a google search yesterday to see what other people are doing with plaster and paper, and was rather surprised that I could only find one recipe – it uses something called Irish glue along with paper and plaster, and I have no idea what that is. I expected a lot of people to be doing their own experiments, since so many bags of “instant paper mache” are sold in art stores. Celluclay and Sculptamold appear to be ground paper and plaster, perhaps with some wheat flour added to slow the setting time. You’d think that with so many people using these fairly expensive products that more people would try to make their own. Maybe there are people in the world who don’t compulsively share everything they do on blogs – is that possible? has the following qualities: When tested by rubbing between the thumb and finger, it was sticky and covered the thumb with a fine coating. (Had it left the thumb clean, it would have been because it contained too much water.) When rubbed upon a pane of glass it sticks tightly and dries hard in 3 hours without cracking, and can only be removed with a knife. When spread in a layer as thin as writing paper it dries in half an hour. 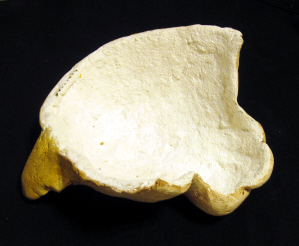 A mass actually used dried hard enough to coat with wax in 18 hours, and, without cracking, became as hard as wood; yet a similar quantity wrapped in a wet cloth and placed under an inverted bowl kept soft and fit for use for an entire week. That sounds pretty close to ideal. Any ideas? I think since linseed oil is, well an oil it may not mix so well the way your doing it. Personally (I could be totally wrong mind you) i think mixing the linseed oil in with the dry (fluff stage) pulp before adding water etc might get the paper to absorb the oil more evenly producing a more even hardness throughout the mix, perhaps in a blender at that stage? Oh the Claycrete plaster mix is way plenty strong for most projects even handling. I need that extra edge to take on heat too for when i create sconce type projects from mass molds. My dragon skin does have some fire retardent qualities & i could simply use that as a final finish since it takes colours so easily. I want the ‘raw feel’ the plaster pulp gives though much more natural bone like i think. I know when i went to research some recipes myself on plaster pulp i found nothing at all & had to work from my own ideas, luckily i have a good working knowledge base of many of the materials i use. All gained from working for the building trade & several years experimenting as i created in PM lol. It always amazes me that how many people use items through their life but never stop to think what potential so many every day abundant materials may have, be they plaster, paper, cheap glues etc. I mean just how did the early monks get the idea of creating a varnish like paint from hens eggs & it lasted centuries too? The Egyptians making crude paper sheets from papier reeds? Cutting up & pulping trees to make paper even? It all comes from what must seem at the time to be very illogical thinking – Yet come it all does. You need to scroll down around half way down to get to the English & Irish glues section. Definately worth looking into later i think. Jonty, you’re so right about how “unreasonable” some ideas seem before someone decides to go ahead and try them – invention seems to require the kind of mind that naturally thinks outside the box. Thanks for that link – if the old recipe is calling for bone glue, it doesn’t appear to be terribly expensive. Although making papier mache with that formula might be a bit fiddly for personal use, since we have other formulas that seem to work as well and are easier to make, it might be fun to play with it. Great to see you got a version of my plaster pulp that works for you. Lol that distinctive ‘ping’ which might be better described as the same sound a ceramic ornament, bowl, plate etc might make is exactly how i know my molds are fully dried by the way. I gently tap both halves or two seperate molds together to see how they sound. the higher pitched & longer the distinctive sound seems to ‘ring out’ the more the mold is dried lol. Yes the plaster pulp mix is definately better suited for mold making/use, but thats just what i intended it for lol. Sadly the working time is very limited especially when you use more plaster than paper. The best wroking time i achieved during experimenting was around 15 minutes. Then again working from molds is not a real issue so not a problem as far as my own uses are concerned. Linseed oil will definately slow down the going ‘off ‘ time of the plaster for sure but not to any worth for free hand sculpting. As it turns out on further research using linseed oil (amounts are unclear & vary a lot) i discovered that many great PM’ers feel linseed oil actually makes PM harder!?! For myself i am still in reserve on this thinking. Using commercial Claycrete with a small amount of sculpting plaster definately produces a very light weight ceramic finish that is hard to beat. The white finish of the Claycrete & the sculpting plaster will give a bleached white finish that is perfect to take any light or dark colours readily. A thin lightly coloured base ‘sealing’ coat is recomended prior to final painting to reduce absorbsion of the final paint layers & reduces thining of the final colour scheme. Personally whilst i want to venture forth with the plaster pulp mix i definately want to try to achieve a more ‘equal’ plaster pulp mix. In doing so i hope to create a ‘hybrid’ that ‘bridges’ the distintion between pulp & plaster but does not become a totally stand alone plaster based medium in its own right. I want to remain in the realms of PM as much as possible. Since i dont use linseed oil i dont get or have any noticeable shrinking issues or warping that would be related to it. 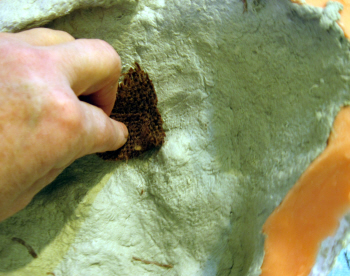 Definately if you want to use a thickness of under 3mm/4mm in your molds using the plaster pulp medium use a thin cotton webbed material between two layers. This will give support to the final demolded creation. The faster the mix dries the more ‘stable the form will remain. Especially once the outter 1mm or so has dried it holds the final shape better i think. With this mix as any others of course it is all trial & error & then of course ‘how’ you intend to use it & for what type of creation in the end. Anyway good to know you have a working version Jonni. Thanks for the comments – helpful as always Jonty. Do you happen to have any finished pieces that you made using your plaster/paper formula? We’d love to see how you’re using it. Concerning the linseed oil – that page about the Victorians said they put the oil on the outside of their paper mache (made with laminated sheets, I think), and the oil caused their pieces to have the strength of hardboard. I was curious, so I brushed some linseed oil on the outside of one of my plaster mother molds, just to see what would happen. It does, indeed, cause the plaster’s surface to become much harder. The plaster without the oil can be easily scratched with a fingernail, while the oiled plaster cannot. I’m not sure how that helps us, or if it helps us at all. But it was interesting. I also think they said that they sometimes used plaster (gypsum) in their formulas, so your plaster/paper formula is still traditional. It’s just a bit more traditional then the newer versions. Which is kind of cool.